So I mentioned last week that I’ve done a LOT of blending lately. I’ve had my Blendtec for about 3 months, and I’ve completed over 100 blends. 100+ folks. 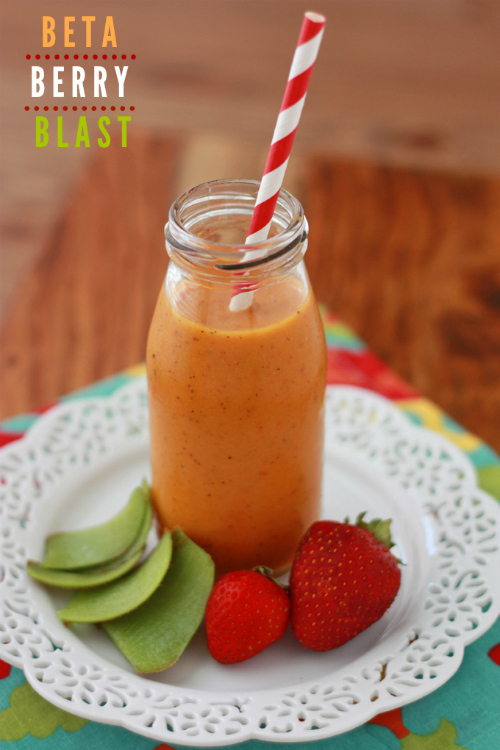 It’s been amazing for smoothies, popsicles, banana ice cream, soup, dip, sauce… everything. But one of the nicest things about having a high-speed blender is experimenting with fruit-and-veggie combinations. I’m trying to ease my picky toddlers into smoothies with fruits AND veggies. We’ve loved trying out green smoothies, but our latest favorite is a nice change from green-smoothie-land. This recipe uses carrot juice as our veggie. You can certainly use diced carrots if you have a high speed blender, but we went for simplicity here. Carrot juice is loaded with beta carotene (hence the name), and isn’t too strong a flavor. It pairs nicely with sweet things, and neither of my children noticed it a bit. The carrot juice is great here. It’s surprisingly creamy, but it also doesn’t overpower the rest of the flavors. 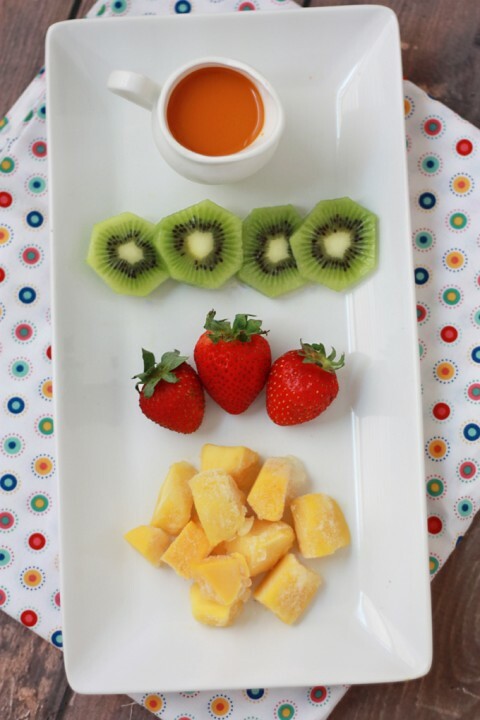 The kiwi gives just the right tartness, and the strawberry and mango keep things just sweet enough. It’s a great afternoon snack, breakfast, or dessert. They’re Sophie and Milo approved, and I think you’ll love them. Hope they give you a great midweek pick-me-up! 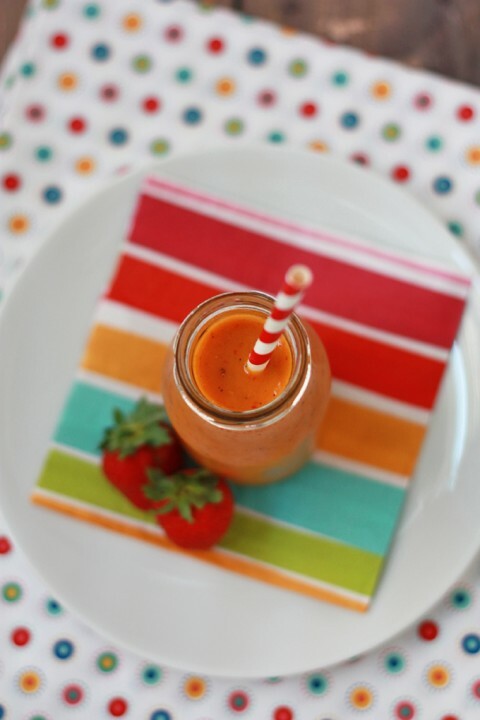 Place all ingredients in a blender and puree until very smooth, adding more carrot juice as needed. Makes 2 grown-up sized smoothies or 4 small ones. Hooray for Blendtec! We find that we love carrot juice if it is made in a juicer (where all the sugars remain in the juice, but all the fiber is sifted out). In our Blendtec, it is not so good (cause all the fiber remains – healthier – which makes it taste more like dirt, and less like the really sweet carrot juice we get without the fiber in it – yummier). 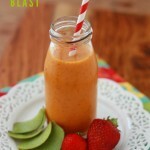 So if we use it (and want it to taste good), we juice the carrots and then add it to our smoothie in the Blendtec. Wow. That was a wordy little tidbit of useless information! WoW! Your photography is gorgeous, and this sounds so delicious!